I’ve cooked many a boneless chicken breast in my day. If I’m being honest, I’ve ruined more than I’ve gotten right. It all started in college, in a tiny campus housing apartment with an electric stovetop. Neither UMBC nor the Office of Residential Life trusted us enough to put ovens in the apartments. And for whatever reason, it never occurred to me to cook the chicken in the toaster oven before it eventually went up in flames. Ok, maybe I can understand why the Hillside, West Hill, and Terrace apartments were ovenless. But it looks like things changed when they put up the new Walker Avenue apartments. Not only do the kids today get apartments with ovens, they also get a volleyball pitch. Those lucky bastards. Note to the folks at UMBC: It’s 2010 and I’m still paying off my student loans so don’t even think about sending me a donation request. If you want to give the kids a full size oven for their frozen pizza, bagel bites, and chicken breasts, some other alum is going to have to foot the bill. BAH Tip: After countless attempts at trying to make this type of creamy pan sauce ended in failure of the curdled, broken variety, it occurred to me that maybe I should try and temper the sour cream and mustard before I added it to the hot pan. Tempering works with custard when I make ice cream so maybe it would work for my pan sauce. You know what? It worked beautifully. A spoonful at a time, I stirred in about 1/4 cup of the reduced chicken broth to my sour cream and mustard mixture. Then I added the mixture back to my skillet and whisked until it was smooth and creamy without a curdle or break to be seen. Place asparagus and water in a microwave safe bowl, cover loosely with plastic wrap, and microwave for 2 minutes. Carefully remove bowl from the microwave, drain water, and set aside. Heat the olive in a large, nonstick skillet over medium high heat. Season the chicken with salt and pepper and add to pan. Cook for approximately 7 minutes on each side until browned and cooked through. Transfer chicken to a plate and cover to keep warm. Add wine to the pan, stir to scrape up any browned bits, and cook until it is almost completely evaporated. Add the chicken broth and cook for approximately 10 minutes until it reduces by half. While the chicken broth is reducing, combine the sour cream and mustard in a small bowl. Once the broth has reduced, temper the sour cream and mustard by slowly stirring in some of the broth a tablespoon at a time. Add the tempered mixture to the remaining broth in the skillet and whisk until smooth. Cook until the sauce thickens slightly, approximately 2 minutes, remove from the heat and taste for seasoning. Add salt and pepper as desired. Add the chicken and asparagus to the sauce and stir to combine. Serve over rice. Tempering the pan sauce–you are a genius! This looks scrumptious! Laughing about your toaster oven chicken! Kitch, per my response to The Other Wendi (who will also be in NYC! ), I’m now convinced that my tempering success was a fluke. A genius fluke in the moment and I’m wondering whether I’ll ever be able to get it to work again. Hey, it’s your Wendi Doppelganger who can’t boil water! But this looks wonderful–I may just attempt it tomorrow. Wendi, what’s going to happen in NYC when we’re both standing in the same room at the same time? Will the Universe implode? You know what goes great with Chicken with Creamy Dijon Sauce? Barry Manilow. Swear to god. So maybe you should have the iPod blaring while things sputter on the stove. And I can’t guarantee that my “suggestion” of tempering the sour cream and mustard so that the sauce doesn’t break will work anywhere outside of my kitchen. Because after I wrote that a while back, I read something online that said tempering doesn’t work with sour cream. It sounded like the person knew what they were talking about, whereas I’m usually making it up as I go along, so I chalked my success up to dumb luck. BAH Fun Fact – dumb luck is my favorite flavor of luck, but it’s usually out of stock so I get stuck with bad luck instead. Bad luck tastes like black licorice. I’m just saying. After the toaster oven went up in flames, it sat outside the front door of the campus apartment for the rest of the year. We used it like a doorstop. I imagine those kids at UMBC with their fancy ovens have no idea how lucky there are. Which sorority? Because my sorority meetings never involved naughty cakes. Would have made Formal Business Meetings way more enjoyable. 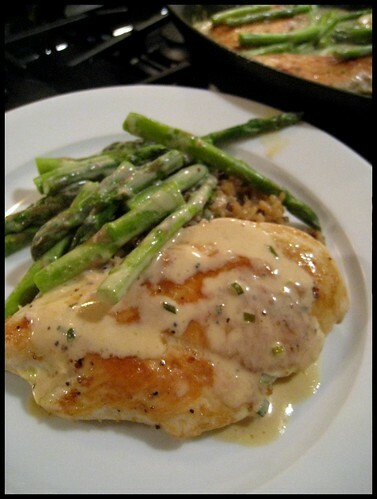 Anything with both chicken and asparagus sounds wonderful to me! And since I am now full of myself after the Paella for Dummies success and the semi successful cheesecake ( ok so the oven is not exactly level and it sloped a little like the pitcher’s mound at Wrigley Field it still tasted SUPERB) and the caramel praline pecan sauce (OMG) sent the spouse into an orgasmic food state, cream sauce should be a no brainer right? LOL! Not sure I can do Barry Manilow……. some of the mellower Spanish stuff here will work I think. Emily, I’ve had more failures than successes with that cream sauce. But maybe that’s just me. Rock out with whatever makes you move. Are you making this drive all by yourself? Not even a singing dog for company?